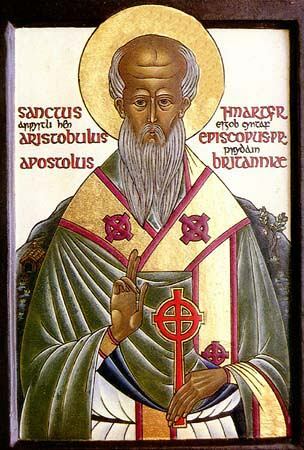 The Holy Disciple from among the 70 – Aristoboulus, Bishop of Britanium (Britain), was born on Cyprus. Together with his brother, the holy Disciple from among the 70 – Barnabus, he accompanied the holy Apostle Paul on his journeys. Saint Aristoboulus is mentioned by the Apostle Paul in the Epistle to the Romans (Rom 16: 10). The Apostle Paul made Saint Aristoboulus a bishop and sent him to preach the Gospel in Britanium, where he converted many to Christ, for which he suffered persecution by the pagans. Saint Aristoboulus died in Britain. His memory is on 31 October and on 4 January also amidst the Sobor / Assemblage of the 70 Disciples.